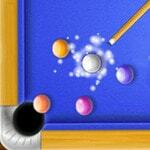 For taken away time the player should go into all spheres in billiard pockets. At забивании several spheres successively, it is possible to receive большее quantity of points. With everyone new level arrangement of spheres will vary, and time to be taken away ever less.